I'm participating in a Christmas Open House in July Linky thing with Carol from The Answer is Chocolate (great blog name). I read about it over at her blog and thought it sounded fun. Here's a card that I made for last Christmas. These cards were the first set and I was going to make 4 more sets of 6 cards. The plan was to give these away as gifts packs. You probably won't be to surprised to find out that I never got the other cards made...but there's always this year. I'm really pleased with the how well the Snowman Stamp turned out. The pack of Christmas paper that I bought, provided a great background. The little rhinestone just set it all off. Can't wait to see all the other Christmas projects. Thanks for visiting. Also linking up to Jens Weekend Wrap Up over at Tatertots and Jello. Make sure you check out the projects over there as well. 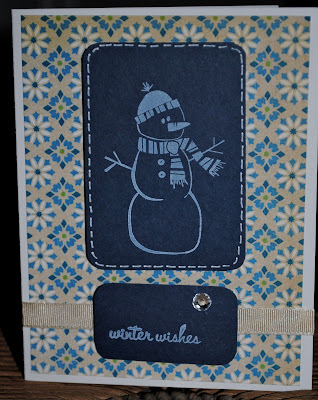 Thanks for visiting my blog...I love your snowman cards,very cute! Oh thanks so much for linking up and these are absolutely adorable! They're so cute but thinking about snow right now is really tough! The cards are great though. How wonderful, I love them. You even have a little bling for Christmas, I love it. 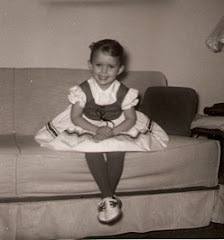 I found your blog over on Carol's Christmas in July's Link Party and I'm now following you. This blog seems to have everything from personal stories to crafts. I'm #22 on the Link and would love for you to follow me so we could be blogging buddies. Thanks! Your snowman cards are super cute! It's been a while since I've used my stamps but I've been seeing so many cute projects using them that it may be time to resurrect them!! Once upon a time I used to make all of my Christmas cards, tags etc.